This next several blog posts analyses how the linkage that can be implemented across the complete enterprise value chain in order to enable greater business control. Experts also offer perspectives regarding key aspects of IIoT deployment. First let’s take a look at three distinct operational environments will set the stage for the smart manufacturing enterprise to emerge. The emergence of the IIoT megatrend has created both hope and confusion among stakeholders responsible for operating industrial plants. Much of the early hype is focused on the impact of technological advancements on existing automation platforms. Figure 1 Holistic enterprise control breaks down enterprise silos and facilitates better business control. However, one of the challenges in understanding the potential of IIoT is the very large scope of applications. In the area of smart enterprise control, for example, we will see self organizing machines and assets that enable mass customization and lot sizes of one. In the realm of asset performance, the collection and analysis of data from increasing numbers of cost-effective and intelligent sensors will increase business performance and asset uptime. A new generation of “augmented” workers will leverage cutting edge technologies, including mobile devices and augmented reality. With easier access to information across the enterprise, their work becomes simplified and production systems grow more profitable. Some of these changes can be implemented in the short to medium term, others will require a gradual evolution with end users and OEMs incrementally adding functionality to their existing legacy systems as new international IIoT standards are established. The smart manufacturing enterprise is made up of smart machines, plants and operations all of which have higher levels of intelligence embedded at the core. The linked systems are based on open and standard Internet and cloud technologies that enable secure access to devices and information. This allows “big data” to be processed with new, advanced analytics tools and for mobile technologies to drive greater business value. This, in turn, enables improvements to efficiency and profitability, increased cyber security and innovation and better management of safety, performance with reduced CO2 emissions impact. While the long term impact of IIoT is at times difficult to predict, three distinct operational environments will set the stage for the smart manufacturing enterprise to emerge. 1. Smart Enterprise Control – IIoT technologies will enable tight integration of smart connected machines and smart connected manufacturing assets with the wider enterprise. This will facilitate more flexible and efficient, and hence profitable, manufacturing. Smart enterprise control can be viewed as a mid-to-long-term trend. It is complex to implement and will require the creation of new standards to enable the convergence of IT and OT systems. One of the biggest potential benefits of next generation IIoT systems is the breakdown of enterprise silos. The technologies will allow for closer integration of production systems and ERP systems, Product Lifecycle Management (PLM) systems, Supply Chain Management and Customer Relationship Management (CRM) systems (see Figure 1). Today these systems are managed somewhat independently of each other, which prohibits a holistic view of the enterprise. It is believed such a holistic approach could facilitate an enormous efficiency gain of up to 26 per cent for enterprises. Smart enterprise control does not mean replacing current automation systems with completely new systems. Instead, it implies the connection of current automation systems with enterprise, lifecycle and value chain systems. This optimizes the entire manufacturing enterprise and enables a much greater degree of business control. 2. Asset Performance Management – Deployment of cost effective wireless sensors, easy cloud connectivity (including WAN) and data analytics, will improve asset performance. These tools allow data to be easily gathered from the field and converted into actionable information in real time. This will result in better business decisions and forward-looking decision making processes. Asset performance management applications such as energy management and predictive maintenance are not new to industry, but have had limited uptake due to the cost of implementation. The costs of physical connectivity (the cost of cabling to the sensors) and logical connectivity (integration with existing systems) have been prohibitive. Wireless IP connectivity and cloud-based architectures now overcome these cost barriers. 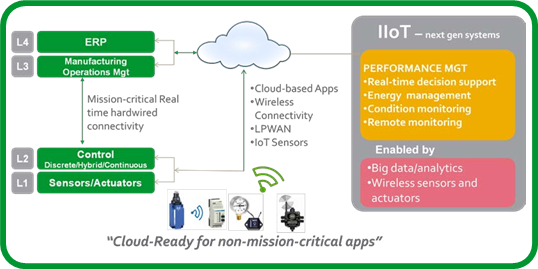 In addition, a new generation of simple, small and low cost sensors is emerging; As a result, next generation IIoT systems will deliver innovative solutions in the area of asset performance (see Figure 2). Consider the example of condition-based monitoring/predictive maintenance. Much money is wasted maintaining equipment that doesn’t require maintenance, or by neglecting equipment that subsequently fails and causes unanticipated production downtime. Solutions such as condition-based monitoring do exist today, but uptake has been limited by cost. Next generation IIoT systems promise to significantly reduce implementation costs for such solutions. 3, Augmented Operators – Future employees will use mobile devices, data analytics, augmented reality and transparent connectivity to increase productivity. As fewer skilled workers are left behind to man core operations due to a rapid increase in baby- boomer retirement, younger replacement plant workers will need information at their fingertips. That information will be delivered in a real-time format that is familiar to them. Thus the plant evolves to be more user-centric and less machine-centric. The use of mobile Human Machine Interface (HMI) technologies such as smart-phones, tablets and wearables, combined with IP-access to data and information (analytics and augmented reality) will transform the way operators work. Portable wireless devices will expand their capabilities and technologies such as dynamic QR codes will improve the operator experience and render the “augmented” operator more productive (see Figure 3). Today, operators only have access to information from automation systems. Tomorrow, augmented operators will access information from all of the needed enterprise systems and will manage not just process performance/efficiency, but also process profitability. 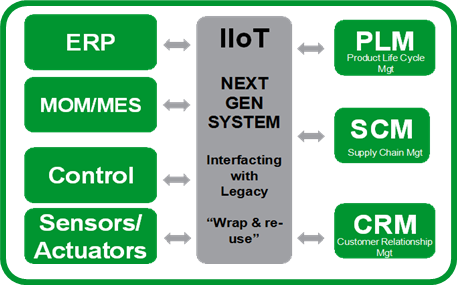 This blog post is based on ”The Industrial Internet of Things: An Evolution to a Smart Manufacturing Enterprise” white paper authored by John Conway is Schneider Electric’s VP for Strategy & Partnerships. The next blog posts will focus on the barriers to adoption. Stay tuned. John Conway is Schneider Electric’s VP for Strategy & Partnerships. In this capacity, he is responsible for strategic intelligence, strategic planning and merger & acquisition activities for the Industry Business Unit. During his 17 years with the company, he has held a variety of roles, starting out as director of microelectronics key accounts. He then moved into the creation and deployment of automation solution centers in Asia and Eastern Europe before running the Advanced Services and Mergers & Acquisitions activities for Industry. Prior to joining Schneider Electric, John held sales and engineering management positions within the automation divisions of Siemens and Texas Instruments. John has a Bachelor of Science in Mechanical Engineering and a Master of Science in the Design of Machine Systems. He is currently based at Schneider Electric’s Horizon office in Carros, France.